We are very pleased and proud that we finally have a proper clinic! The dream has finally been realised thanks to Container World, Umbilo Business Forum, Lead Architects, We Are Durban and UKZN medical students, the Municipality - and the South Durban Area Management team. There was such joy from the hundreds of local residents, partners, donors, staff and volunteers when Cardinal Napier blessed the container clinic recently. The next challenge is to boost funding so the Dalton clinic can be open every day. Read the report of the opening in the August 2017 newsletter. The outreach work of the clinic means that each month we see a further 400 patients in the community in addition to the 2,000 we see in the clinic. 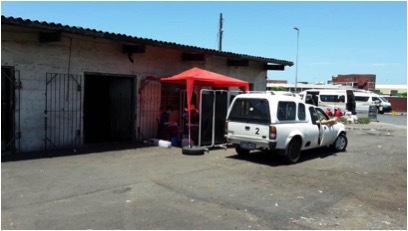 A simple bakkie and tables set up under a gazebo is currently our only way of providing street-side healthcare for the homeless. We provide the only source of healthcare accessed by many of the local people, including those with TB and HIV. Container World, a local corporate, has donated the container and undertaken to cover the costs of conversion. Staffing a daily service here would be possible working in partnership with the nearby UKZN School of Medicine. 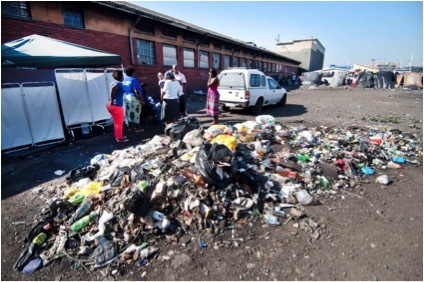 We are awaiting a co-operation agreement with the Municipality who own the site and whose help we need to connect to power, water and sanitation. Although most Dalton residents are single men, there is a surprising number of women and young children. Children live in shacks and derelict buildings; they play in the rubble, glass, stagnant water and on the pavements of busy main roads. Some are malnourished and many suffer from respiratory tract infections. As a result, our priority became to establish a safe and stimulating play group, where food and health care is provided for the pre-school children. After meeting and consulting with mothers, gogos (grandmothers) and other carers, a play group was established in Dalton at the beginning of October 2015 in a rented room opposite the Dalton Beer Hall. Play group equipment and toys have been donated through churches and individuals. Food is provided through the clinic and the feeding programme at the Denis Hurley Centre and a qualified early childhood development teacher is being sponsored to run the playgroup three mornings a week. We welcome between 15 and 25 children to the playgroup.